Why does the John Frieda Hot Air Brush Work So Well When Drying and Styling Hair? Would you like a little speed boost when getting ready to leave your house each day? Most people feel the slowest part of getting ready each day is blow drying and styling their hair. Well if these tasks were combined it stands to reason you could cut your hair styling time in half. That is exactly what hot air brushes claim they can do. One of the most popular ones is the John Frieda Hot Air Brush. Read along as we check this hot air brush out in a little more detail. There is a lot to like about this hot air brush. It is lightly powered at 500 watts but makes up for that with an advanced airflow design. It has three different temperatures settings (hot, med and cool) too. It’s ceramic and titanium coated barrel will produce hot air in just a few seconds. 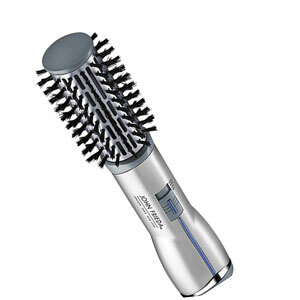 It also features a 1 ½” barrel that is round in shape and has soft bristles that resist tangling as you style your hair. This is among the most compact and lightweight (weighs around a ½ pound) hot air brushes you will find. You can use it for long periods of time without getting tired. Its salon length cord with handy swivel end also allows for maximum freedom of movement as you are styling and drying your hair. There are two things that really stand out to us about the John Frieda Hot Air Brush. The first is its very good ceramic/ionic heater coating and infusion. This will really help protect your hair from heat damage as you use it. Ceramic heat is known to be very even heating that is gentle on hair. Ionic infusion cuts down on hair moisture loss and helps prevent static flyaway hairs and frizz. The other nice thing about this hot air brush from John Frieda is its vent design. Even though it only has 500 watts of drying power this is enhanced by the way the air vents are placed around the barrel of this hot air brush. The warranty on this hot air brush model is fairly ordinary. It only comes backed up by a 2-year warranty. That is right about at the industry standard for a hot air tool in its price range. One of its biggest disadvantages is it will take you a long time to dry very wet head of hair. That is because it only features 500 watts of drying power. Most real powerful hair dryers are powered by 750 watts or more. Make sure you damp dry your hair before using this to speed up getting ready. Another complaint many users have is how the heat selection buttons are recessed. Users claim because of their position on the handle and the fact they are slightly recessed, which makes it difficult to switch the heat setting while this John Frieda hair button is in use. We all really like this air brush with a catch. That is only if you don’t need a hot air brush that dries wet hair quickly. As far as just light drying and styling goes this hot air brush model is nearly perfect. It’s ultra-light and has a very good bristle design that limits the catching and tangling of your hair as you style it too. 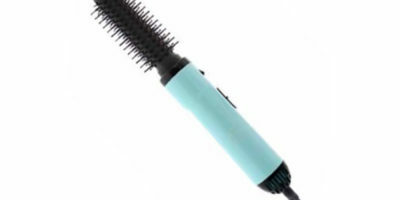 This is also a very budget friendly 2-in-1 hair styling tool. Not a bad choice at all if you want an inexpensive hot air brush that dries damp hair and styles it nicely at the same time.